When the first 3D transformations in CSS got support on Webkit browsers people got incredibly excited about them. Now that they have matured we also support 3D CSS in Firefox. To see it for yourself, check out one of the latest nightly builds. You can see this in action in the screencast below alongside Chrome and you try the demo out yourself. The slight jerkiness is actually my MacBook Air impersonating a starting jet every time I use ScreenFlow and not the browser. Oleg Romashin also spent some time to convert a few CSS 3D demos to work with Mozilla and you can check the 3D city for more “wow”. If you are new to CSS 3D transformations here’s a good beginner course and a tool to create them. As always, If you find any bugs, please report them at bugzilla.mozilla.org! So please reward our hard work bringing the third dimension to Firefox’s CSS engine by supporting and testing. Cheers! Where can I download NyanBrowser? I see that backface-visibility also works => lets get flipping! It usesa WebM video, so only works in Chrome IIRC. WebM has been supported in Firefox since 4.0. Good good you people are stupid. Read the article, you illiterates. Inevitably Muphry’s law bites you in the a$$! Great. Although the poster circle demo is nowhere near as smooth as the other demos on my system (it’s not a Macbook Air either), it’s actually pretty jerky. The poster circle demo is also jerky on my system, while it runs super smooth on Chromium. Any chance someone can point us to the appropriate bug on bugzilla? I think ‘perspectiveProperty’ should just be ‘perspective’. Also the replace should be ‘.replace(/Perspective/i,”);’ to account for the none-prefixed version not having an uppercase ‘p’. This way the code will still work if browsers drop the prefix. Wow, and wow again. Really great work y’all! 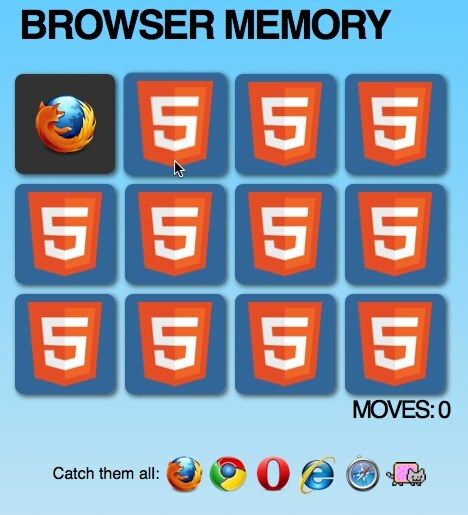 Love the browser memory game. I have a very modest system, and all of the demos work just fine, including the poster circle. It isn’t jerky at all. 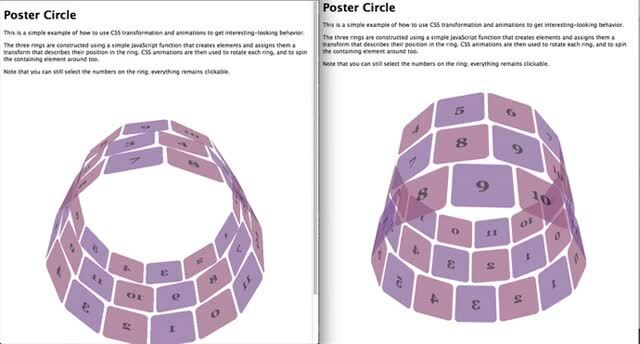 It would be cool, and quite trippy to mix the poster circle demo with the browser memory game. In a lot of cases in webkit, the above feature detect will provide a false positive. Since about two-three years ago, all webkit ports parse and understand `perspective` as a property, however the actual implementation of 3D transforms is up to the port. You need a nightly version (10!) for this to work, until it is merged to Aurora (next week). There is also a -moz-perspective : 1000px (same with -webkit) on the body, in another .css. Hey Vinci. I don’t know too much about this, but according to moz dudes, the 3d CSS spec is kind of vague on something or other (paint order?) and this does impact the perspective on one demo I saw. According to them, it can vary even on different webkits (OS/card or somesuch). Dunno. Maybe one of them can weigh in, perhaps if you filed a bug. I’ve adapted this CSS/JS script http://tympanus.net/Development/Slicebox/index5.html to support -moz- prefix. It’s just ugly. It has artefacts everywhere. Where is the best place to post the result ? bugzilla.mozilla.org ? I’ve just updated a CSS 3D experiment I did a while ago, and now it works with Firefox nightly too. I have tweaked the 3d also a bit and created polygon here, though its sluggish in Mozilla. It works perfect in Chrome. THIS is the future. But it should be NOW. Firefox needs to hustle and make this happen already as many businesses and social/learning sites fall behind when major market share browsers are stuck 2 years in the past. As a developer, i am really let down by the browser that I have supported for many years. I am disheartened to see the lack of innovation and foresight and, to be blunt, arrogance on the part of the team regarding delivering ‘webkit’ like 3D rendering. Look, these browsers are free and provide an immeasurable service to all of us so I feel dirty having to post even one criticism of Firefox. But if you are going to assume the responsibility, do it properly. Stop holding us back. Stop holding yourself back. Get this up and running in 2012 – find a way. @Joel… what are you talking about that looks perfect in Firefox. Very impressive actually. Mind = Blown. Microsoft… Time to wake up, dump IE, pre install Firefox, Chrome, Opera or Safari and just let people who know what they are doing deal with the internet. MS need to focus on their operating systems and office documents and let the internet professionals handle web browsers. Just working on my layout, weeks ago I found the 3d css tester and I think, it is wunderbar, great!!!! This reminds me of hotmetalpro. But a little better. Thanks a lot, I will link your 3d css tester. It works ok, but a little leg, maybe my pc. No attempt at all at cross-browser? Reflection admittedly uses an alternate (and more powerful) syntax in Firefox, but most of that could have so easily been made crossbrowser. http://www.instantlyemail.com/ has a nice timer that flips in 3D. Seems to work slightly better in webkit than firefox at the moment. Useful for temporary email address too!